The 2019 $0 down, VA home loan limit for Oneida County is $484,350. Oneida County is a smaller county located on the southern edge of Idaho. The Idaho County Legislature officially created the county on January 22, 1864 from a portion of Dakota Territory. With its many national protected areas, Oneida County has many places for outdoor activities. The county is in proximity to the Rocky Mountains and several lakes, giving it some of the most majestic views. The county encompasses a total area of 1,202 square miles, 1,200 miles of which are land, and 1.5 miles of which are water. The population of Oneida County is 4,184, including a veteran population of 417. Oneida County is a popular destination for avid fishers. The abundance of king-sized trout and salmon bring in people from all over the state. There are over nine reservoirs in the county, so you have many different options! The best part is that fishing is available year around in Oneida County. A reservoir famous for its large fish is Daniels Reservoir. The reservoirs also make for excellent boating, water skiing, and canoeing opportunities. Standing at an elevation of 9,035 feet, Elkhorn Peak is the tallest point in Oneida County. Avid hikers will enjoy the many trails in and around Elkhorn Peak. The trails can be used for hiking, mountain biking, and even horseback riding. The top of Elkhorn Peak offers some of the most majestic views you can find in Idaho. Elkhorn Peak is also home to many different species of plants and animals, making it a great place for exploring. Curlew National Grassland is just one of the national protected areas partly located in Oneida County. Curlew is made up of 47,790 acres of bright green grassland. Mule deer, white-tailed deer, elk, and rabbits are just a few of the many species that can be found in Curlew National Grassland. Thanks to the surrounding mountain ranges, Curlew National Grassland possesses excellent views of Oneida County. One of the most fun events held annually in Oneida County is the Malad Valley Welsh Festival. The Welsh Festival celebrates the Welsh background of many citizens living in Oneida County. The festival features delicious food, fun games, and entertainment. The Welsh Festival also features a bake sale, educational seminars, and a community cookout. Several veteran resources are located in Oneida County. Educational benefits, healthcare benefits, and disability compensation are just a few of the great benefits offered to veterans living in Idaho. The median housing cost in Oneida County is $126,100, and the median household income is $40,842. Contact VA Home Loan Centers to apply for your VA loan today! 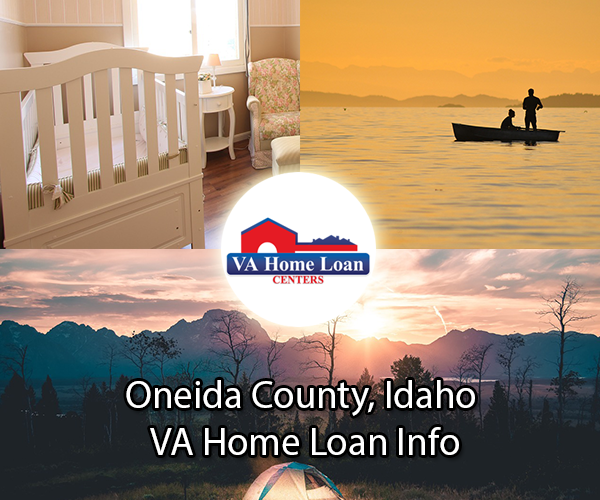 For help finding a VA-approved property in Oneida County, call VA Home Loan Centers at 888-573-4496. There are not currently any VA-approved condos located in Oneida County. For help getting a condo approved, click here.